At this time there is no definitive cure for Chronic Fatigue Syndrome (CFS). There are a number of treatment options for managing the symptoms to some extent. Some of these options are conventional medicines, some are chemical supplements, and still others are natural treatments. To target a higher rate of success, all three are often used in conjunction. All treatments should be evaluated and approved by a physician. Some herbs have shown to be helpful in treating the symptoms of Chronic Fatigue Syndrome naturally. One of these is passion flower. A tincture of this herb is thought to aid in the reduction of both insomnia and muscle pain. To improve sleep rhythms and quality, try valerian which is classified as a relaxant. An all around natural treatment for CFS is olive leaf extract. It has the property of reducing the overproduction of yeast which is a contributing factor to the fatigue associated with CFS. Additionally, a study of 155 subjects with a history of persistent fatigue done at the University of Iowa revealed that a majority found the use of ginseng to be one of the most effective treatments. One of the most debilitating aspects of Chronic Fatigue Syndrome is the lack of energy. Some non-medicinal items reputed to restore lost energy are carrot juice, bee pollen, and kelp. Ashwaganda is also reputed to restore energy in addition to boosting overall strength. 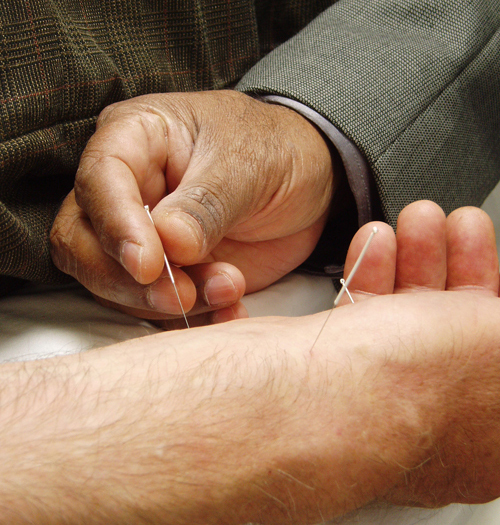 Some patients report that acupuncture has given them some measure of relief. A skilled acupuncturist has the knowledge to apply his craft to not only the patients pain issues but to the fatigue problem as well. Are you a skeptic? There is such a volume of anecdotal evidence for the efficacy of acupuncture that it has earned a wide acceptance in the medical community although it is not as accepted as common medical procedures such as immunization shots in some quarters. A less intrusive alternative is acupressure for common ailments . The same spots on the body are targeted but pressure is applied with the fingers rather than inserting a needle. One advantage is that the patient can perform the treatment herself. Yoga is being widely used to combat fatigue. The theory here is that yoga is a naturally invigorating activity that works the muscles gently, increases blood circulation, moves oxygen through the system, and is a tonic for ones mood. The founder of the American Yoga Association, Alice Cristensen, recommends five minutes of breath exercises combined with twenty minutes of meditation and four yoga poses. As time goes on, more and more natural treatments for Chronic Fatigue Syndrome are gaining respectability. There is hope that by working closely with conventional medicine suffering can be held to a minimum until a cure is finally found. Just What is Holistic Medicine? Website © 2011 KSmith Media, LLC; all rights reserved; content may not be copied, rewritten, or republished without written permission.